Infrared is the electromagnetic radiation outside the color spectrum range of visibility, at the lower end and next to the red. Infrared film has been sensitized to this radiation. Infrared film is commonly used at séances where there is total darkness, or where the light is too dim to allow regular photography. In this way it is possible to photograph things which cannot be seen under many séance conditions (e.g. ectoplasm, spirit forms). That region of the electromagnetic spectrum at wavelengths immediately above the visible spectrum; the heat in this region of the spectrum which is generated by a light source usually is undesirable (since it represents a loss in efficiency), but such heat is used in industrial applications for drying, baking a surface, etc. 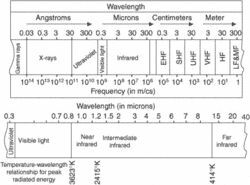 That portion of the electromagnetic spectrum with a wavelength longer than deep red light (wavelength between 7800 and 1,000,000 angstroms and just slightly longer than the longest wavelength of visible light), thus not visible but sensed as heat. See also near infrared and far infrared.